McALLEN — The county bailiff facing conspiracy charges allegedly forged U.S. Magistrate Judge Dorina Ramos’ signature on a federal search warrant, new court records show. In a newly filed superseding indictment filed Wednesday, De La Cruz and a former Donna ISD police officer, as well as three others are named as being part of a drug conspiracy — the second conspiracy charge for De La Cruz in less than a week. The county bailiff was released from custody Tuesday afternoon after the court granted him a $200,000 bond, but the possibility of him facing other charges was made reality Thursday after the superseding indictment was unsealed. De La Cruz faces another drug conspiracy charge on top of the one he was charged with Tuesday. During that detention hearing the government, represented by Roberto Lopez Jr., claimed they suspected De La Cruz was lying about his finances based on the investigation into him, and the discovery of bank records that showed large unexplained cash deposits. Lopez asked the court to prohibit De La Cruz from going back to his job at the courthouse because of his access to sensitive information, such as sensitive law enforcement and court documents. This based on the allegations against De La Cruz, which state he helped with the movement of cocaine by procuring court any police documents related to drug seizures for people working for drug cartels. 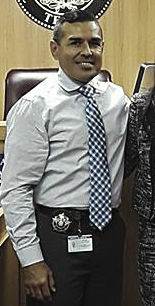 De La Cruz along with Marin “Filtro” Macrin Cerda, Jose Miguel “El Mickey” Montemayor, Cesar Alejandro “Nucho” (or “El Sobrino”) Tovar-Guillen, and Juan Fernando Mata, a former police officer with the Donna ISD Police Department who has more than 13 years in law enforcement experience, were named in the superseding indictment, court record shows. Jorge Antonio Calvo-Ayala, 25, of Pharr pleaded guilty last year to conspiring to possess with the intent to distribute more than 5 kilograms of cocaine, court records show. Earlier this month, U.S. District Judge Micaela Alvarez ordered Calvo-Ayala to serve 95 months in federal prison to be immediately followed by five years of supervised release, according to a Department of Justice news release. “In handing down the sentence, the court considered Calvo-Ayala’s role in a April 2017 home invasion in San Juan, in which members of the rip crew conducted a home invasion armed with firearms to steal more than 7 kilograms of cocaine,” the release states. The release further stated that additional members of the rip crew were also responsible for several home invasions or “carjacking,” and were in search of controlled substances, primarily cocaine. These cases included a June 2015 carjacking in Mission, a February 2016 home invasion in Hidalgo, a July 2016 carjacking of an 18-wheeler in Edinburg and a November 2016 shootout involving an attempted carjacking in McAllen in addition to a January 2017 carjacking in Palmview. Other cases include a March 2017 carjacking in McAllen, an April 2017 home invasion in Mission, an April 2017 carjacking in Pharr, an April 2017 home invasion in San Juan and a June 2017 home invasion in McAllen, as well as a July 2017 home invasion in Mission. According to the release, those who have also pleaded guilty in the conspiracy and are pending sentencing include Danny Cano, 30, Antonio Javier “Little T” Gomez, 28, Marlyn Gonzalez, 39, and Arturo “Petu” Vargas (or “Cholo”), 35 — all of Mission. Others who pleaded guilty include Mexican nationals Miguel Marin “Tigre” Cerda, 30, Jose “Coco” Garcia-De La Torre, 22, Carlos Guadalupe “Tomy” Aquino-Pacheco, 20, Alfredo “Chore” Avalos-Sanchez, 26, Gustavo Angel “Tripa” De Leon-Covarrubias, 19, and Jose Arturo “Gordo” Reyes-Sanchez, 19, along with Juan Antonio “Paisa” Flores, 27, of Weslaco. Mata, 39, of Donna, appeared in federal court Thursday afternoon, wearing a long-sleeve black T-shirt and blue jeans for his arraignment and detention hearing in connection with the allegations. The government alleges in count one that the defendants conspired to possess and distribute more than 5 kilos of cocaine from January 2016 to February 2018, the indictment states. The government did not oppose granting a bond for Mata, who had surrendered to U.S. Marshals Wednesday, but asked that a condition of his release be that he not seek employment in law enforcement — something his attorney said would not be an issue. Mata pleaded not guilty to a single drug conspiracy charge in the seven-count indictment. Inside the nearly empty courtroom were members of Mata’s family, including his mother, sister and brother, who were working with the probation court to settle his bond amount. Magistrate Judge J. Scott Hacker said he would take the probation office recommendation and look it over before deciding to grant a bond. De La Cruz, is expected back in court next week, May 16, according to his attorney Santos Maldonado. This report was updated to reflect Ramos is a magistrate judge. This report was updated to reflect that Juan Fernando Mata worked for the Donna ISD Police Department.